65th Birthday Cards or 65th Anniversary Cards. 1950 Trivia Playing Cards. 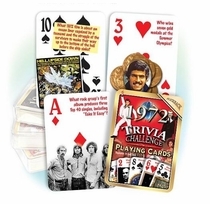 For a unique 65th birthday gift or 65th anniversary gift, consider this set of trivia cards. 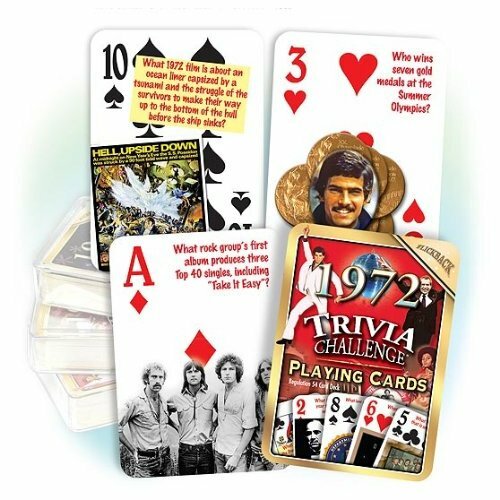 These 65th birthday cards are a standard 52-card deck that also happen to have 1950 trivia questions on them. Included with the question is an image related to it. The answers to all of the questions are found on a single answer card. Review these sample 65th birthday cards: Which world famous comic strip begins its run on Oct 2, 1950 and ends on the day after its creator's death, February 13, 2000? (Peanuts), Who does Elizabeth Taylor marry this year? (Conrad Nicholson Hilton Jr), What singer becomes the first to concurrently have a number one record on the Pop, R&B and Country Charts? (Patti Page), Who says "If A is a success in life the A equal X plus Y plus Z. Work is X, Y is play and Z is keeping your mouth shut". (Albert Einstein), Which TV show starring a popular comedian makes its debut on CBS this year and will run for 15 years? (The Jack Benny Program), Which country becomes a republic in 1950? (India). See also our other 65th birthday gifts and 65th anniversary gifts.